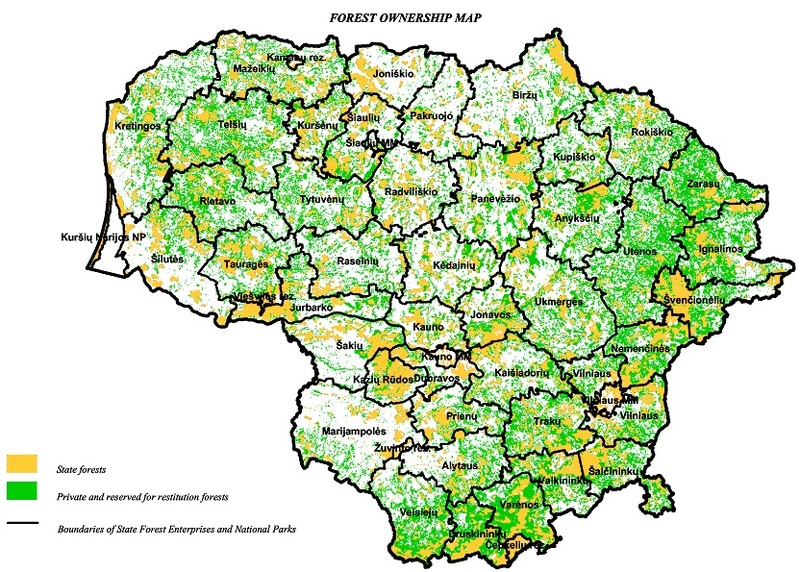 In 2010, around half of the total forest area in Lithuania was of State importance. 42 State forest enterprises and 1 national park, under subordination of the Ministry of Environment, managed 1,028,000 ha of forest land (Fig. 18). The average size of forest districts is 3 000 ha. The implementation of forest policy and strategy is under the responsibility of the Forest Department at the Ministry of Environment. Reforestation, protection and use of forest resources of state forests attributed to forest enterprises are organized and coordinated by the General Directorate of State Forests under the Ministry of Environment. General Directorate of State Forests is an institution, responsible for the economic management of state forests, attributed to 42 state forest enterprises. The General Directorate of State Forests establishes the mandatory norms for forest enterprises regarding reforestation, protection and management of forests; it also organizes and co-ordinates the implementation of advanced technologies in reforestation, protection, and use of forests and forest resources. The uniform system of state fire prevention measures, comprising monitoring, preventive and fire control measures, is established and kept in forests irrespective of the forest ownership status. This uniform state system of fire prevention measures is implemented and organized by the General Directorate of State Forests and the state forest authorities and directorates of national parks along with town (regional) municipalities. In 2010, the number of private forest owners amounted to almost 242 000 and a forest property/plot was in average 3.3 ha.